PIERRE, S.D. – Gov. Dennis Daugaard announced today that he will appoint Mark E. Salter of Sioux Falls to the South Dakota Supreme Court. 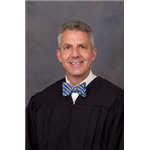 Salter is a circuit court judge in the Second Judicial Circuit. Salter will be the 51st justice in the history of the South Dakota Supreme Court. He will succeed Justice Glen A. Severson, who will retire in June after nine years on the Court. Like Justice Severson, Salter will represent the Second Supreme Court District, which is comprised of Minnehaha County. Salter, 49, was born in Huron and is a graduate of Parker High School. He earned his bachelor’s degree from South Dakota State University in 1990 and was a Thomas Sterling Honor Graduate of the University of South Dakota School of Law in 1993. Following law school, Salter worked for a year as a law clerk in the Third Judicial District of Minnesota. Salter was commissioned in the United States Naval Reserve in 1993 and entered active duty with the U.S. Navy in 1994. While in the Navy, Salter served in the Judge Advocate General (JAG) Corps as both a prosecuting attorney and a defense attorney. He was released from active duty in 1997 and later served in the active Naval Reserve until 2002. He served as an inactive reserve officer until 2012 when he was honorably discharged with the rank of lieutenant commander. After leaving active duty, Salter joined the Cutler & Donahoe law firm in Sioux Falls, where he became a partner and focused on civil and business law. While at Cutler & Donahoe, Salter also served for a year as Turner County deputy state’s attorney. Salter joined the U.S. Attorney’s Office in 2004, where he was the chief of the office’s appellate division from 2009 to 2013. During his tenure he worked with U.S. Attorneys Jim McMahon, Marty Jackley and Brendan Johnson. Gov. Daugaard appointed Salter as a circuit judge in the Second Judicial Circuit in 2012, and he took office in early 2013. Salter is the presiding judge for the Minnehaha County Veteran’s Treatment Court, and has sat as a temporary justice with the Supreme Court. 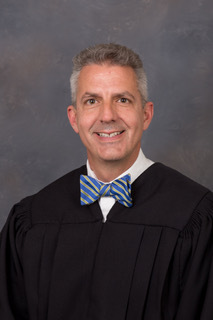 Salter also serves as an adjunct professor at the USD School of Law, where he previously taught advanced criminal procedure and currently teaches advanced appellate advocacy. Salter and his wife, Sue, have four children. They are members of Holy Spirit Catholic Church in Sioux Falls.